We live just down the street from a mall. We find ourselves there a few times a week to play at the play-area or just to go for walks before the stores open. It's a novelty I've quite enjoyed. 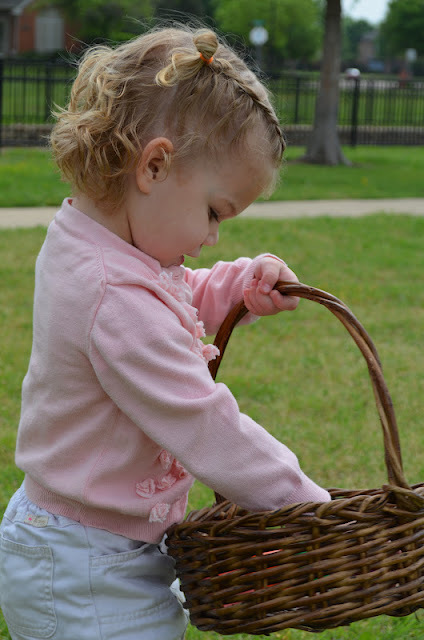 During the Easter season we went there a few times to walk and on multiple occasions walked past the Easter Bunny only stopping to wave and say "Hi". Being the cheap-o that I am, I never stopped to sit on the Easter Bunny's lap because 15 dollars for a picture is about 14 dollars too much out of my price range. 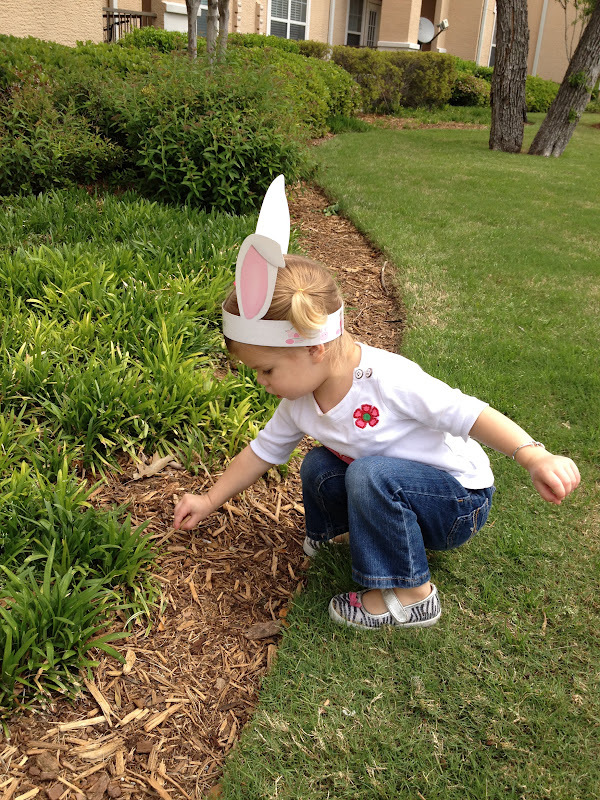 One morning my friend, her son, Grace and I stopped by to wave at the "Easser" Bunny, as Grace would call him. 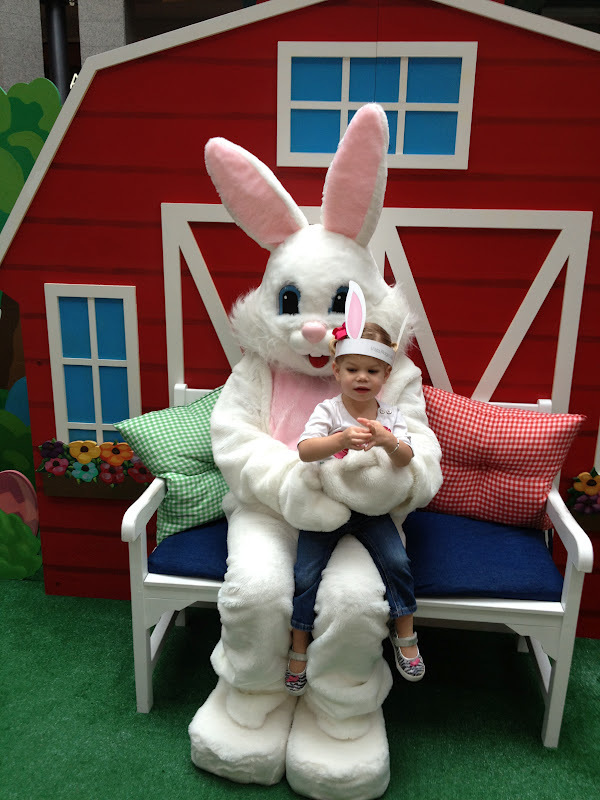 There was no line and the attendant said "Do they want to sit with the Easter bunny? We won't charge you." Free? Yes, please. They even threw in a few Bunny ears. I was fully expecting Grace to freak out, since, to this day, she still talks about being scared of Santa Claus, but after seeing her friend Kayson sit on the Easter Bunny's lap and not bat an eye, Grace felt up to the challenge. She looks thrilled, doesn't she? I was pretty proud of her new found confidence. 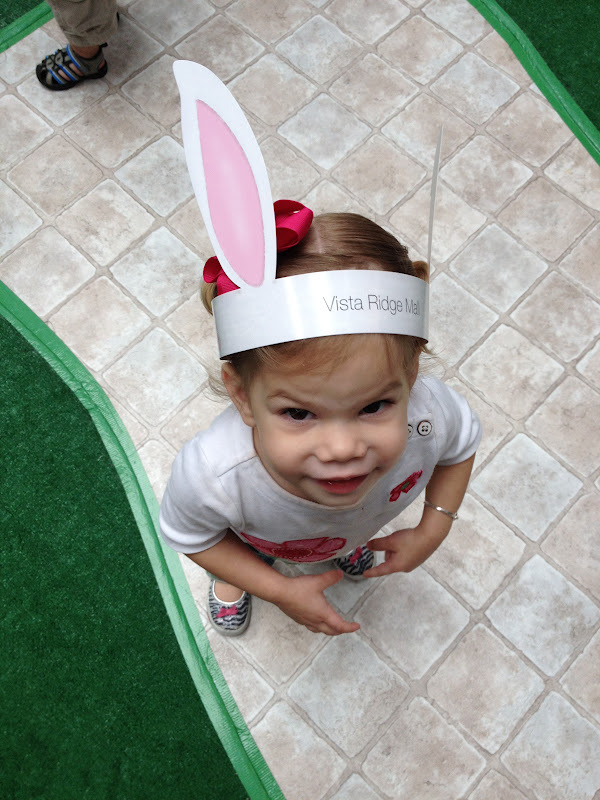 The bunny ears were definitely her favorite part and she wore them around everywhere she could. Later in the week our playgroup had a potluck egg hunt. Delicious lunch and then a mad dash for candy filled eggs. Thankfully we had a lot of adults on hand to contain the excitement that multi colored eggs bring out in kids. The kids were beside themselves having to wait and eat lunch before they could fill their baskets. But the time finally came, and the kiddos took their places. 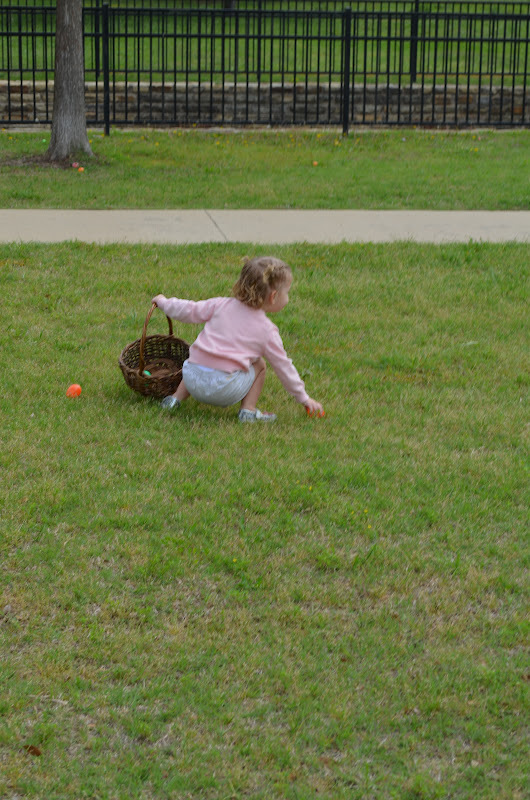 I wasn't sure what to expect with Grace, but she kept to the side and casually picked up eggs and then screamed with excitement. 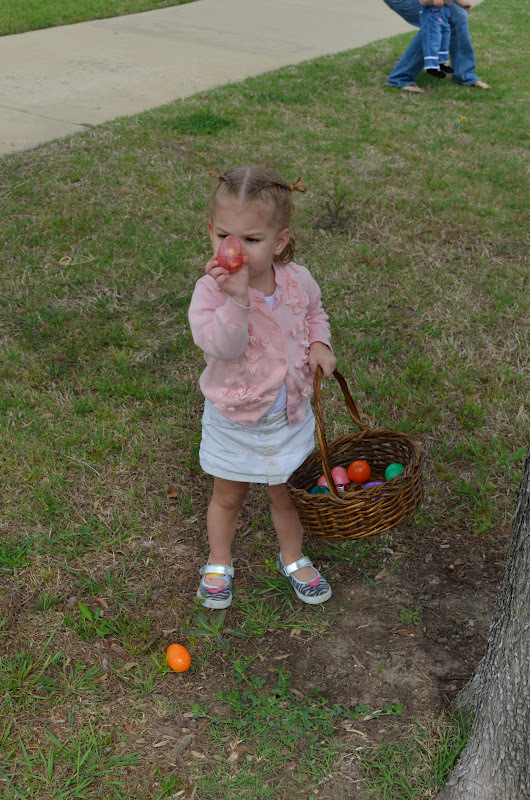 She walked past a lot of eggs and I had to point out a few to her. But, in general, she caught on to the concept. And did a pretty stellar job filling up her basket....and then eating the candy inside as fast as humanly possibly. Through the heat and the festivities, Grace and I both napped hard in the afternoon. Waking up later to polish off of the rest of the Easter Candy. It was a great way to jump start the Easter season. 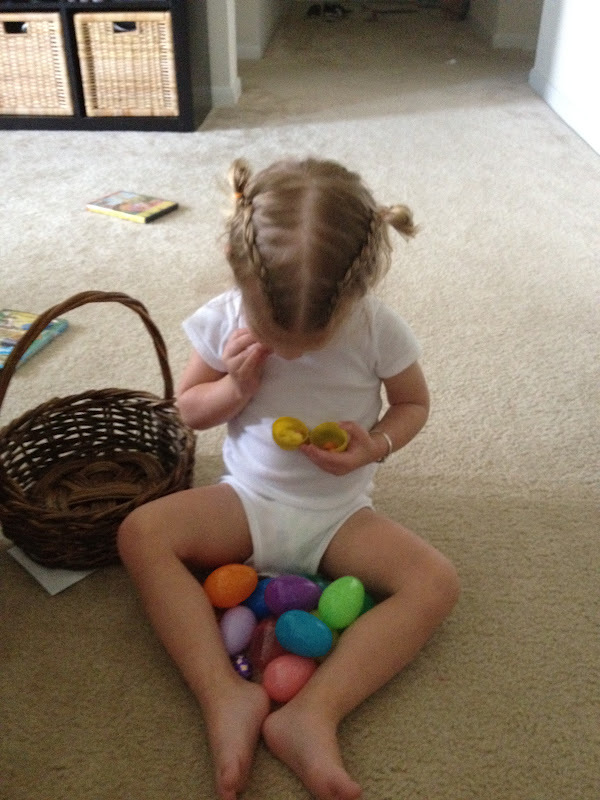 I love her French braids! You have major talent when it comes to styling baby fine hair! I'm dying over the $14 out of my budget. Pretty sure its $15 out of mine. Hilarious. Miss you guys. I am DYING over these pictures. Grace is a little girl! And her hair is brilliant! Nice job, mama. 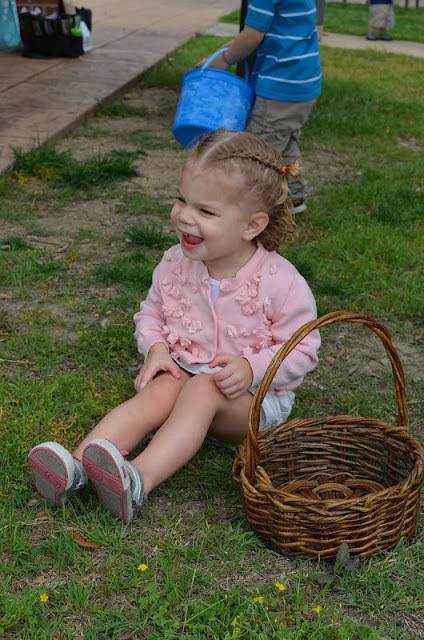 Glad you guys had a fun Easter. She is so adorable, great pics!! She's so cute! I LOVE her shoes!!! Where'd you get them? 1 - We live SO close to each other! 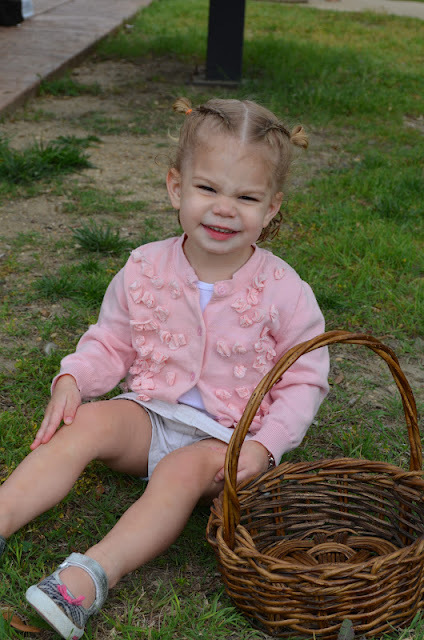 2 - Those little braids are too darn cute! 3 - I LOVE big shades. LOVE. Easter in Houston - Longest Recap Ever.